Mittoni: ASUS Want You To Get Primal.... FarCry Primal That Is! Free Game Promotion Feb 15 - April 30. 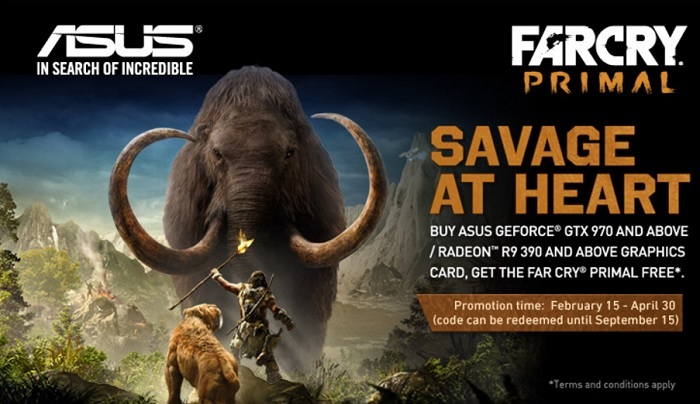 ASUS Want You To Get Primal.... FarCry Primal That Is! Free Game Promotion Feb 15 - April 30. For a limited time, buy ASUS GeForce GTX Titan X, Titan Z, 980 Ti, 980, 970 or Radeon R9 FuryX, Fury, Nano, 390X & 390 graphics card get Far Cry Primal free! Welcome to the Stone Age, a time of extreme danger and limitless adventure. When giant mammoths and sabretooth tigers ruled the Earth, and humanity was at the bottom of the food chain. As the last survivor of your hunting group, you will learn to craft a deadly arsenal of weapons, fend off fierce predators and outsmart enemy tribes to conquer the land of Oros and become the Apex Predator. Would you like to know more? full promotion details page.